Who Can Attend the retreat? All youth currently in grades 6-8. Time and date: Starts at 7:00PM on Friday, February 22nd and ends on Saturday, February 23rd 6:30PM. Cost:$20 per registrant. The registration fee includes a gift, meals, snacks, and retreat supplies. Scholarships are available upon request. Payment can be paid with check, cash, or credit/debit card. What do you do on retreat? On our retreat we will focus on growing in relationship with Jesus, while also growing closer to the community – the Church – that He has placed around us. We will pray, play games, engage in discussion, worship, and strive to become a stronger community of young people that support each other in their faith journey. Accommodations and Chaperones:Youth will sleep in classrooms, separated by gender, under supervision from adult chaperones. 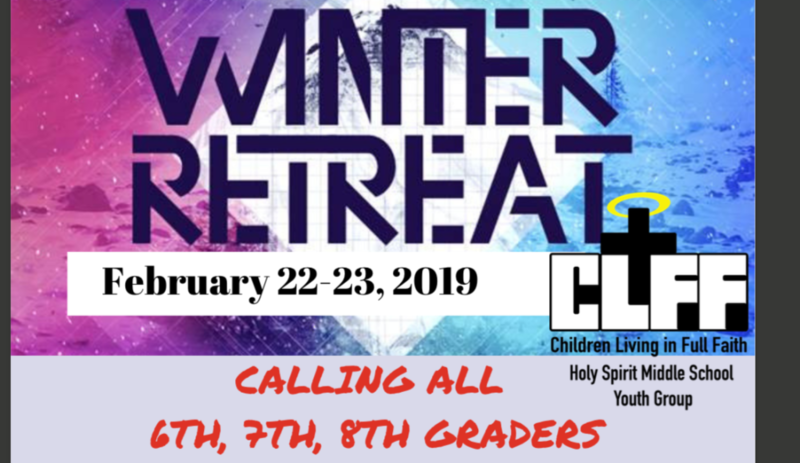 If you are interested in helping us by chaperoning this retreat, and you have completed the Diocese of Boise’s Safe Environment Workshop as well as received a cleared background check from the diocese, please let me know.